Oops - we don't appear to have a video for the Truper 3610. The low volume production scanner segment just got a little faster. Kodak Truper 3610 document management scanner offers one of the highest speeds and duty cycles in its class. 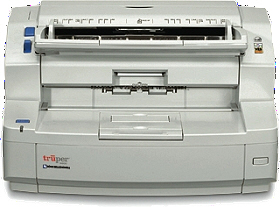 As a rotary scanner with a flatbed for exception documents, Truper's unique combination of image quality, duty cycle and speed make it an attractive option for service bureau overflow, busy office environments and businesses with exception document scanning needs.